THE CEDARBURG CHAMBER OF COMMERCE STAFF Welcomes You! 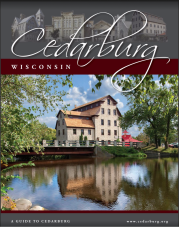 The Cedarburg Chamber of Commerce was organized in 1902 as the Cedarburg Advancement Society, formally becoming the Chamber of Commerce in 1945. Chamber offices are located on the second floor of the building. The Visitor Center is on the ground floor, and inside the Cedarburg History Museum. The General Store collection, formerly housed along with the Visitor Center, is now housed at the Cedarburg History Museum.